Dusty is a 78lb black male that won't turn 3 until November 26th. His sire is the famous Lonesome Cry and his dam is TMB Sweet Alex. He just retired from the Daytona Beach Race Track. He only raced a few races there before his kennel closed. He also raced a few races at Palm Beach and Derby Lane. He didn't race long and only has 29 races listed. Dusty is a very friendly, sweet guy that stood with his head on our shoulder for an entire 2 hour drive. He seems like he has a real goofy personality that shows in his pictures. He does have a short attention span and wants to check out everything at once which helped him pass his cat and small dog tests. Small dogs cool! Cool cats! Look a plant! What is this a rug? A toy! Look a TV! Wow so much to see! 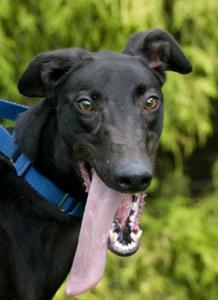 Dusty is a handsome guy that has a shiny black coat and will make someone a fun friend. He is young and does have a higher energy level because of his age than a typical couch potato greyhound probably because he is so young. He is bouncy and does pull on leash trying to see everything in his exciting new world. He does have an amazing tongue but in his defense it was a really hot day when the pictures were taken. Dusty's trainer at the track took her 3 boys with her to the kennel so all her dogs are used to being around children. Dusty is doing great in his foster home on a farm with the cats, chickens, goats and cows.